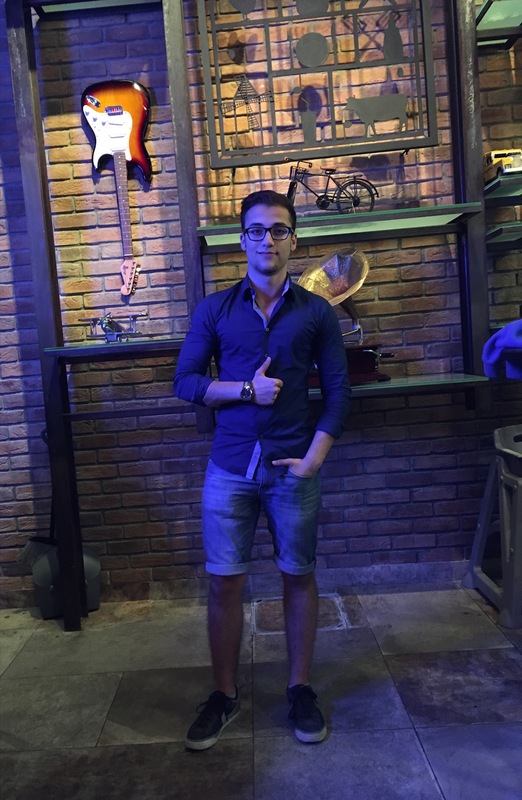 So let me talk about this about briefly, I wore this outfit to my friend’s birthday, it was organised in a cool shawerma restaurant for dinner, also please excuse me for the bad lighting because it was night time, and I know what you might think, it is fall in November in Dubai so why is he wearing shorts, well if you ever came to Dubai you will know that there no such thing as fall it only gets cold at the last few days of December and the start of January. Basically this is my dressy yet casual outwear for dinner and events like this with friends and family, it is not super dressy so you do not look like you lost your way and ended up here because obviously everyone is going to dress casually, but it is dressy enough for you to stand out. Frankly this outfit is quite simple, I went with a nicely fitted shirt and you can basically go with any kind of shirt you would like, and I paired it up with a pair of normal jean shorts but obviously you can pair it with any kind of jeans you would like or chinos, but remember if you want to maintain the dressier look try to avoid distressed jeans because they make your outfit look more casual but if you do not care about that then go for it, and finally for the shoes I went with my favourite fashion sneakers but obviously you can go a bit dressier with a pair of wingtips, loafers, or chealsea boots if you are wearing a pair of jeans or chinos, you should not under any circumstances pair jean shorts with dressy shorts because it will throw off your whole look. I love your style. I wish the boys back at my school would dress like you!